My internet has been spotty and I’ve been distracted so somehow I missed this, via Womanist Musings, Prof BW, Kevin at Slant Truth and a host of others. 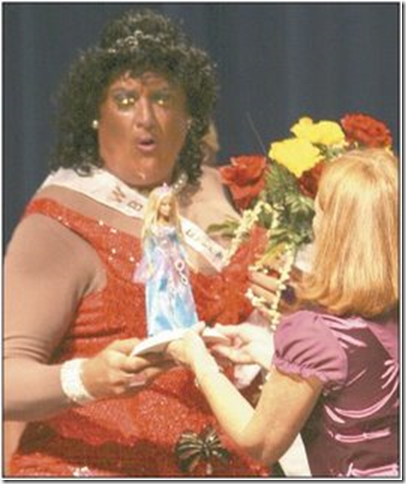 Mel Kuhn, the Mayor of Arkansas City Kansas, won a beauty pageant fundraiser last weekend. Kuhn participated in the Men in Tights, drag queen contest that has become an annual fund raiser for CASA, Court Appointed Special Advocates. The agency supports foster children in the court system. After discussion the mayor offered a statement in which noted it had been brought to his attention how offensive his actions were. To his credit he did not offer the old “if anyone was offended I’m sorry” routine. Even so, as Renee indicates – what year is this? 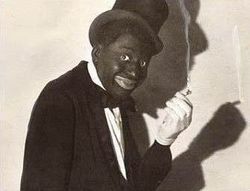 Where exactly is the post racial society the pundits were crowing about Obama bringing in (the same Obama whose image was hung at a George Fox University just the other day, whose image was mocked Aunt Jemima style on a box of waffles at the Values Voters Summit (you can still buy them online – buy 3 get one free – no link here, sorry).